Berlin is a busy city. With 3,5 Million habitants and many visiting tourists, it can get crowded once in a while. Therefore it can be nice to slow down once in a while and enjoy a day of wellness. In this article we list five relaxing day spas in Berlin. Do I have to be naked in a spa? No, not in all wellness-centers it is obligatory to be naked. It depends from resort to resort. To give you some guidance we wrote the answer to this question under every days-spa in this list. Below you can find our five favourite day-spas in Berlin. If you have any suggestions, please let us know! As mentioned we have been visiting several day spas in Berlin and our clear favourite was the spa called Vabali. This spa is located in Berlin-Mitte, which is the first large benefit for anybody visiting Berlin for just a couple of days. You will not lose much time reaching the spa because it is only 500 meters away from station Hauptbahnhof. 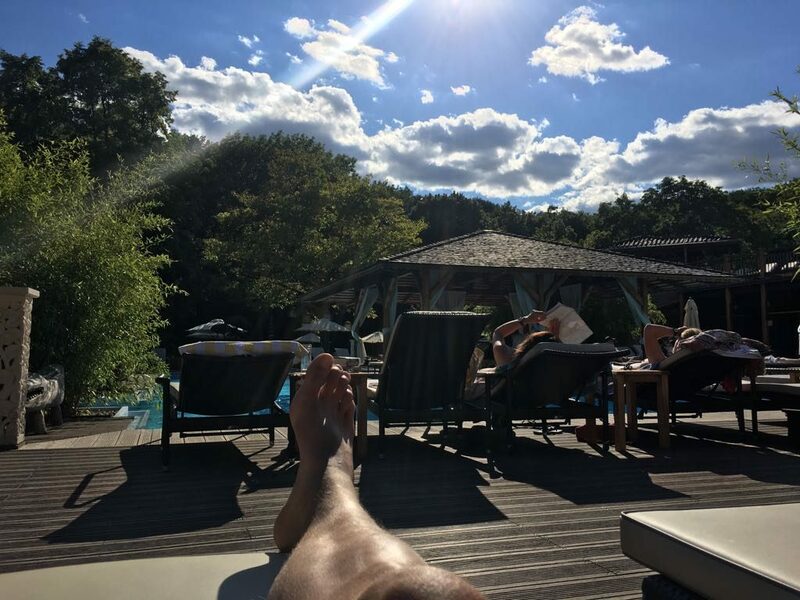 You could even go there and relax if you have to checkout of your hostel or hotel and your train from Hauptbahnhof leaves later in the afternoon. Vabali is such a great spa to visit because it offers a very wide range of saunas and steam baths. They offer herbal saunas, russian saunas, saunas with different temperatures and also saunas just for women. Compared to some other spas in Berlin, Vabali offers a lot more space inside and outside of the saunas and steam baths. It has has a huge garden, a large terrace and two floors with many relaxation rooms. Another great thing for working people is the fact that Vabali is open till midnight. This means that you can even visit this day spa after work and still have enough time to totally calm down. If you cannot stay for a long time it does not matter either because you can also buy 2-hour tickets. They are priced 21,50€ during the week and 23,50€ in the weekend. A full day-ticket can be bought for 36,50€/39,50€. This does make Vabali one of the more expensive day spas in Berlin. Another place for wellness in the middle of Berlin is called Liquidrom. Because the spa is located on walking distance of Potsdamer Platz, it is easy to visit it after a day of sightseeing. The Liquidrom is a reasonably priced spa-resort with 4 different saunas, several pools, steam-baths and plenty of relaxing areas. Besides all that they also offer an outside area and a bar where you can order a wide range of food and drinks. The highlight of this spa-resort in Berlin is the musical pool, which is a pool in which visitors can enjoy plays with lights and music. Because this is a saltwater-pool, you can just float around and enjoy the lovely atmosphere. 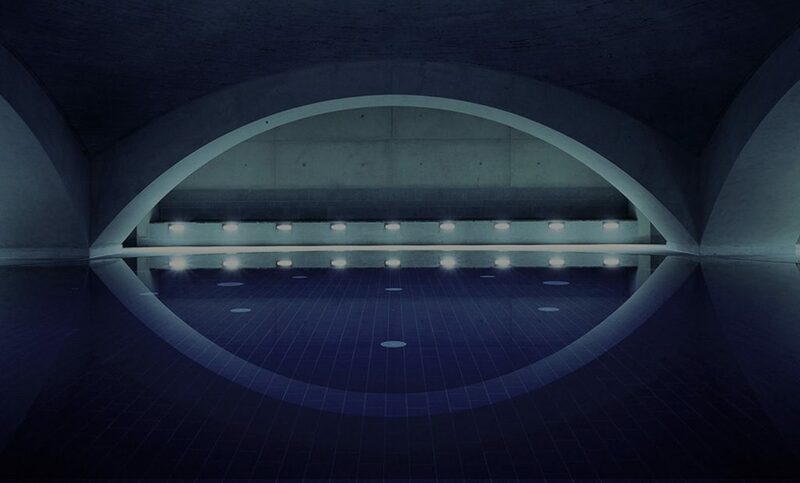 In this pool you are requested to wear swimwear at all times, but in all other pools you can decide yourself if you want to wear something it not. 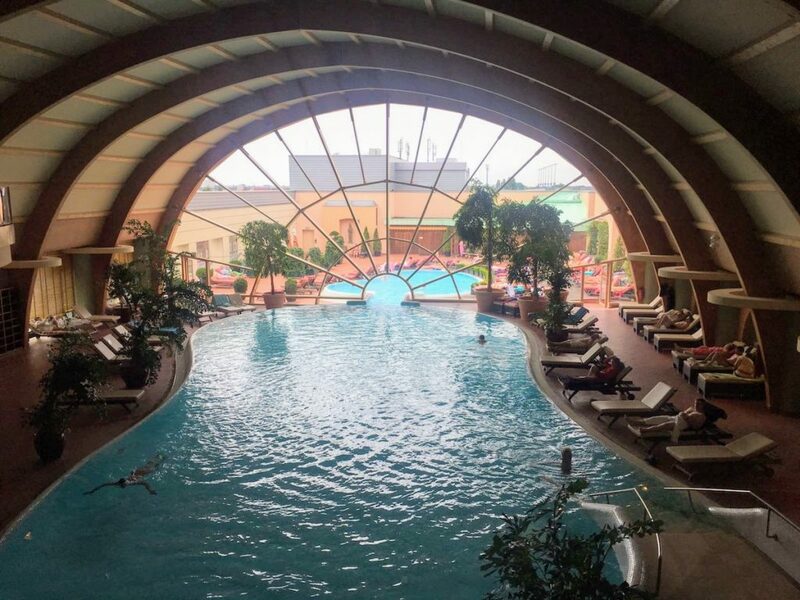 Compared to Vabali, which is also a spa with a central location, the entrance-tickets in the Liquidrom are a bit cheaper: A full day pass for this wellness-resort can already be bought for 29,50€. It is easiest to reach the Liquidrom from a station called Anhalter Bahnhof, or just take a 10 minutes walk from Potsdamer Platz. Although the Meridian Spa is a bit further away from the center than some other wellness-spas in this list, it is definitely worth a visit. This spa offers a large pool which is partly indoor and partly outside. There are many very comfortable deck chairs: Both inside and also outside on the roof of the Spandau Arcaden. Besides that there is a nice restaurant which offers a versatile menu with soups, salats and main dishes. Besides the pool, the Meridian Spa also offers more than 10 sauna’s, steaming baths, solariums and if you want to spend some extra money you can also enjoy a nice massage. 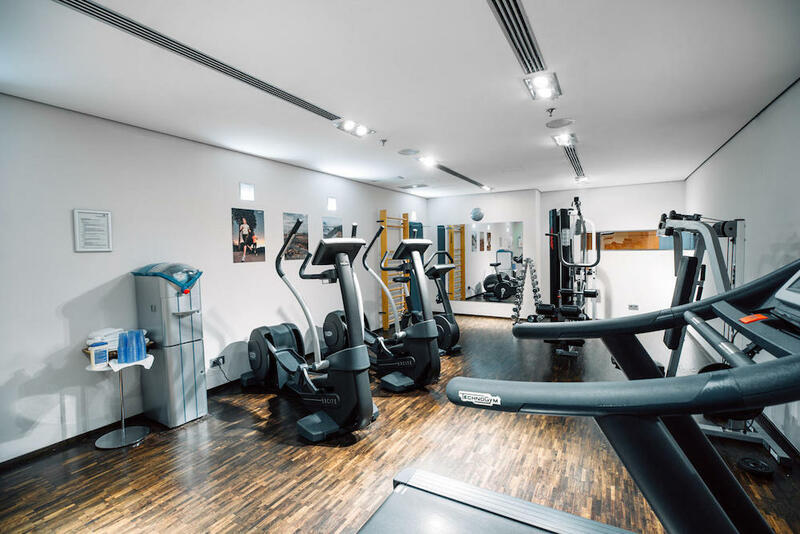 Another great benefit of this spa in Berlin is, that you can enjoy all the fitness equipment for free. This means that you can first get sweaty and enjoy some wellness afterwards. 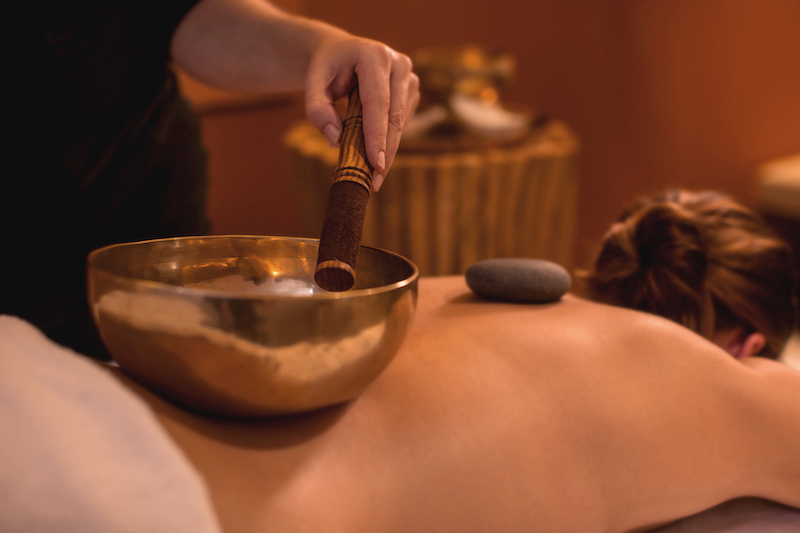 The prices in the Meridian Spa depend on who late you want to check-out. You get the best deal if you go there early and leave before 14.00 during the week (20€). On the other hand staying a whole day in the weekend costs 36€. Meridian Spa offers everything you want for a nice wellness day in Berlin. It can be a benefit for some of you that you can also wear bathing clothes and they offer a large choice of different sauna’s. If you want to visit the Spandau Outlet once, it can also be combined with the Meridian Spa easily. 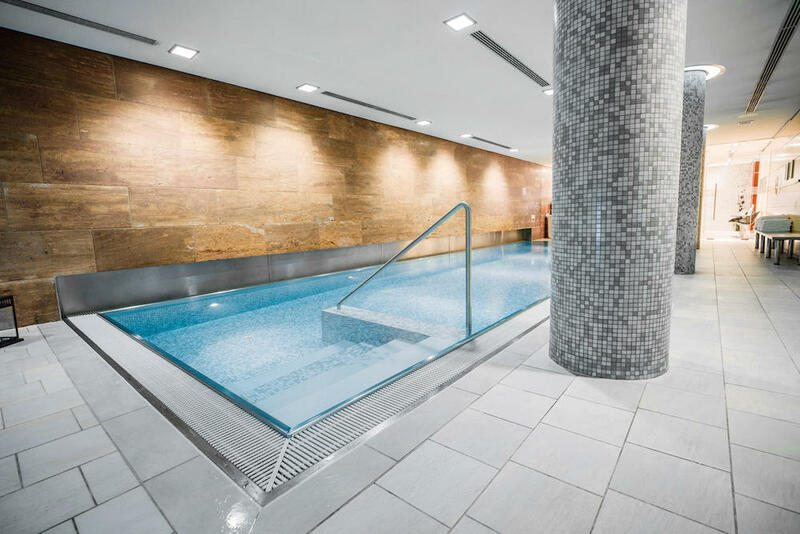 The day-spa in Berlin with the most central location is probably the Heaven Spa of the Radisson Blu Hotel. It is located directly next to the Berliner Dom, which is located not far from Alexanderplatz and shopping-center Alexa. This spa was crowned World’s Luxury Spa Award several years in a row so this should tell you something about the quality of the spa. One of the places inside the Heaven Spa, which is really lovely to relax, is the pool with a water temperature of 28 degrees. This is perfect for both swimming activities or just relaxing and floating around with a partner or friend. Besides the pool this spa also offers a Finish sauna, a lovely steam-bath and several different types of massages. 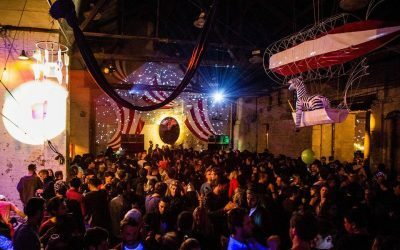 Day tickets for the Heaven Spa can be bought online for 25 Euro. As one of the only days-spas in Berlin this place also has nothing against larger groups. You can order group-packages on their website and get an even better price per person. Because the Heaven Spa is part of the Radisson Blu Hotel, you can also decide to stay over if you do not want to leave Berlin just yet. Lichtenberg might be a district in Berlin which you haven’t heard of, but it is actually directly next to Friedrichshain. Therefore, the Vienna House Andel’s Berlin is located nice and central and can be reached by foot from station Landsberger Allee. The hotel itself and the lobby is worth a visit (and stay) but if you are looking to relax in the hectic city of Berlin, you might want to checkout their own spa-area called SpaSphere. 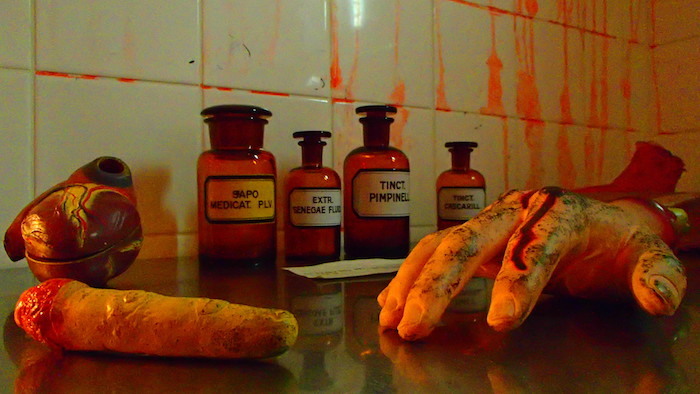 Although it is mostly used by guests of the hotel, you can also buy day-tickets if you are not staying in the hotel. The spa of the Vienna House Andel’s Berlin offers a whirlpool, three sauna’s (bio, classic and finnish), a relaxing area inside and outside. Beside that I can speak from own experience that the massages are incredible and reasonable priced. 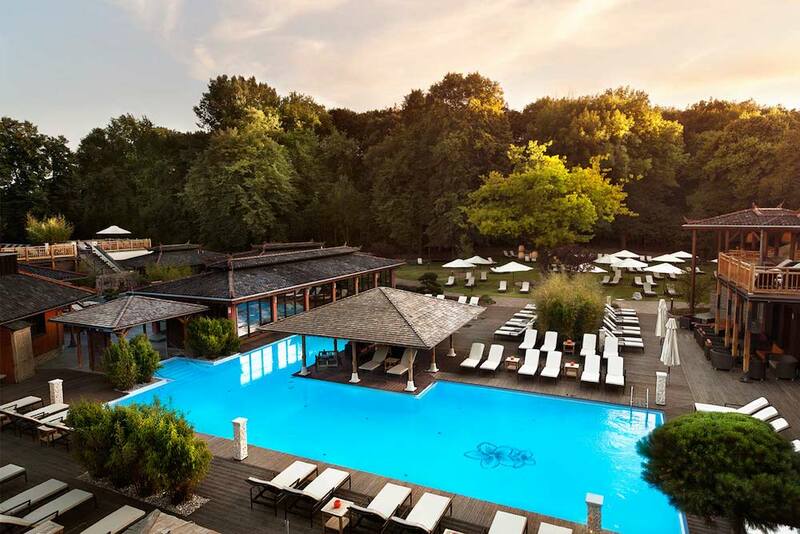 Compared to some of the other spa’s in Berlin in this list, the spa of the Vienna House is bit smaller (550 m2) but the upside of this is that it is mostly not crowded at all. We visited on a Saturday afternoon and were almost alone. This is a big plus compared to places like Vabali, Meridian Spa and the Liquidrom. 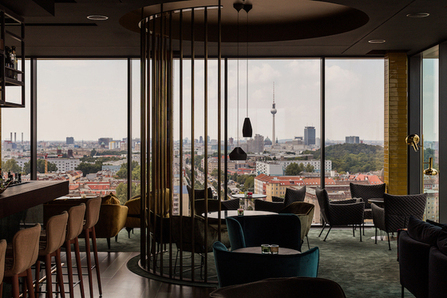 After relaxing in the spa for a few hours, you should definitely have a drink in the famous SkyBar on the 14th floor of the Vienna House Andel’s Berlin. The view over Berlin is incredible and you can shoot some great pictures of the Fernsehturm. The drinks and snacks are reasonable priced and the staff was very friendly. All in all there is plenty of choice if you want to enjoy a nice afternoon of relaxation in Berlin. In the end it all comes down to what is important for you: Some of the places have a swimming pool and others are more quiet. If you really want a massage, you can have a look at the prices on the websites. If you will spend a lot of time in different sauna’s, I recommend visiting our first choice. In general it makes sense to visit these spa’s in Berlin during the week because the weekends are way more crowded. 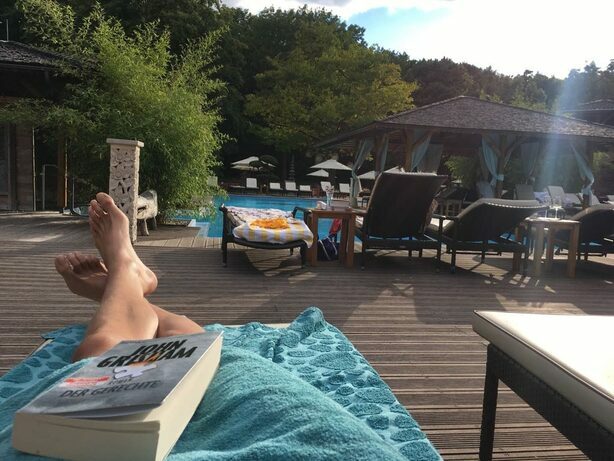 Have fun and let us know if you have any suggestions regarding wellness-resorts in Berlin.